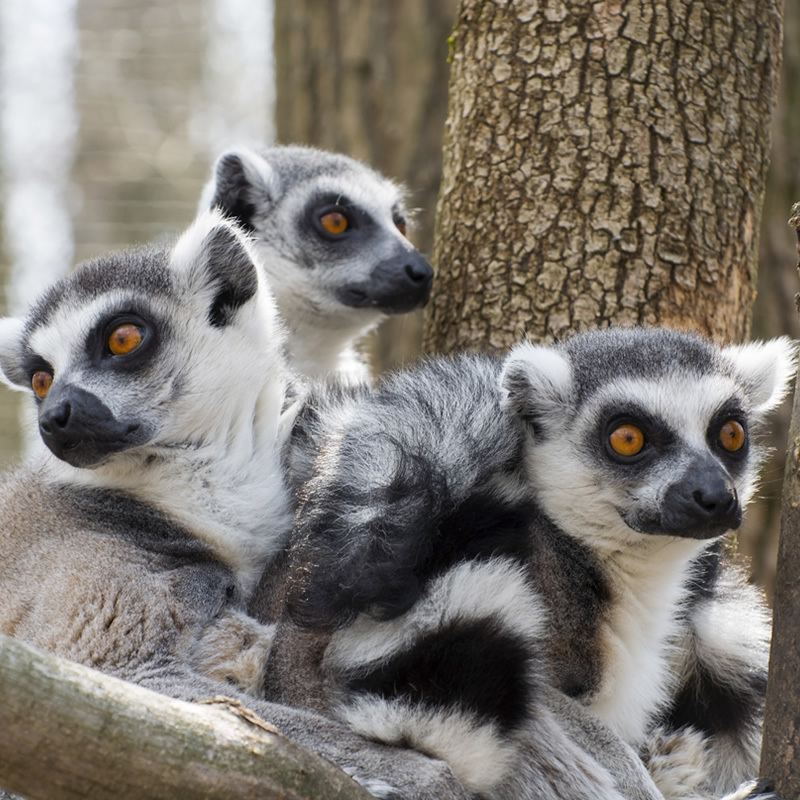 Lemurs live on the island of Madagascar and the Comoros Islands, which are both located off of the Southeast Coast of Africa. As their range is strictly limited to these areas, they are highly dependent on conservation efforts to maintain a healthy population. On Madagascar, they have several different habitats, ranging from rainforests to dry areas of the island. Lemurs vary in size but they average about 2 ft (.61m), not including the tail. The adults weigh anywhere from 5 - 7 lbs (2.27 - 3.18kg). These interesting creatures are actually a part of the primate family, meaning their distant cousins include animals such as gorillas and chimpanzees. Their most noticeable trait is also the one that gives them their name - their black and white-ringed bushy tails. It isn't their only unique trait though! They also have large, yellow eyes with small pupils. Finally, they have white fur on their faces and small, pointed ears. Their snouts and noses are covered almost entirely black. The rest of their body is grey, fluffy fur, except for their underbellies which is white fur. All of these features combine for a considerably cuddly looking animal, but it is important to always leave them be in the wild. Like many other primates, lemurs find much of their food while climbing in trees. There, they will eat different types of fruit, leaves and insects. They particularly enjoy the fruit of the tamarind tree, which looks a lot like a large brown bean or pea pod. The female lemur's gestation period is about 2 - 5 months. They will usually give birth to one or two offspring for a given pregnancy.